Corals can reproduce asexually and sexually. In asexual reproduction, new clonal polyps bud off from parent polyps to expand or begin new colonies (Sumich, 1996). This occurs when the parent polyp reaches a certain size and divides. This process continues throughout the animal’s life (Barnes and Hughes, 1999). 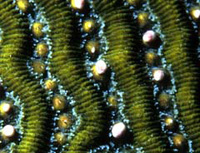 About three-quarters of all stony corals produce male and/or female gametes. Most of these species are broadcast spawners, releasing massive numbers of eggs and sperm into the water to distribute their offspring over a broad geographic area (Veron, 2000). The eggs and sperm join to form free-floating, or planktonic, larvae called planulae. Large numbers of planulae are produced to compensate for the many hazards, such as predators, that they encounter as they are carried by water currents. The time between planulae formation and settlement is a period of exceptionally high mortality among corals (Barnes and Hughes, 1999). Along many reefs, spawning occurs as a mass synchronized event, when all the coral species in an area release their eggs and sperm at about the same time. The timing of a broadcast spawning event is very important because males and female corals cannot move into reproductive contact with each other. Because colonies may be separated by wide distances, this release must be both precisely and broadly timed, and usually occurs in response to multiple environmental cues (Veron, 2000). The long-term control of spawning may be related to temperature, day length and/or rate of temperature change (either increasing or decreasing). The short-term (getting ready to spawn) control is usually based on lunar cues. The final release, or spawn, is usually based on the time of sunset (Veron, 2000). Planulae swim upward toward the light (exhibiting positive phototaxis), entering the surface waters and being transported by the current. After floating at the surface, the planulae swim back down to the bottom, where, if conditions are favorable, they will settle (Barnes and Hughes, 1999). Once the planulae settle, they metamorphose into polyps and form colonies that increase in size. In most species, the larvae settle within two days, although some will swim for up to three weeks, and in one known instance, two months (Jones and Endean, 1973).